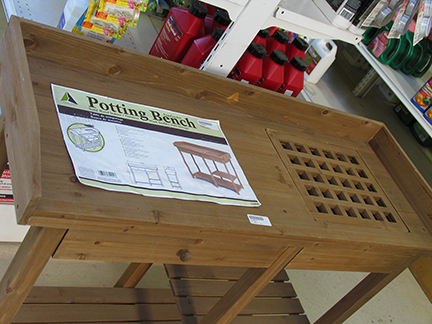 Get Set Up For Spring with Your Very Own Potting Bench! 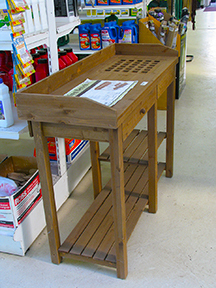 This sturdy potting bench features a spacious and convenient Triple Tier shelving design for use as storage, a work surface or to double as a patio buffet table. Made from kiln dried solid fir wood this potting bench includes an elegant cappuccino colored stain with weather resistant treatment. thicker table legs provide additional strength and sturdiness. The table is pleasantly scented and suitable for both indoor and outdoor use. A latticed table top grate keeps mess away from the potting area and allows excess soil or waste to easily collect in the removable resin potting tray below. A backsplash border prevents soil from spilling over the potting surface. The pull out drawer allows for tidy and convenient storage of small garden tools. Minimum amount of assembly required. Instructions and hardware included.